Popped in on Thursday 2nd July after the West Ham game and it was packed to the rafters, both bars were mobbed as well as the garden. At least 7 bar staff on who dealt with the line of punters pretty efficiently. Their were 3 ales on which but my choice Bombardier only had 2 pints left in the pipe so I switched to Courage Best. The first pint of Best was slightly ropey the next 2 were excellent. The young bar man short changed me first time around but when I challenged him he gave me the right change back, good lad! My 3rd visit here and I will return again as it’s a decent pub with good ales in an otherwise desert for real ale drinkers. Have been there several times in 2014, building up to Friday 13th for a Trail, this Historic Pub may not look too much from the outside but the exterior hides a gem within, two cracking Bars - one is a quite Bar, plus a private function room! Even the large walled garden feels like its miles away from the noise & bustle of the Plaistow streets. Tom the Landlord could not have been more accommodating. Six great rotating Ales, especially Captain Bob, good sarnies that fed 50 (plus) of us! Cricket, Football & Horse racing on different screens for sports fans, none of which were too loud to spoil a conversation. Still a great pub, captain bob , landlord broadside and doom bar, we're on when I called captain bob was just great,it so good I didn't try the others. Shame last reviewer would not concentrate on what happens inside a nice pub rather than what happened outside on the street. We'll worth the visit again. Not such a wide choice of beers as I'd hoped but no complaints about the quality, the Landlord was very drinkable! I was there on a Saturday lunch time and unfortunately they weren't doing food. (According to their website they only do food on a Saturday when West Ham are at home). 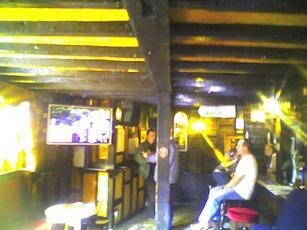 Despite this it was still busy, with football on the large tv (and racing on the other one). Seemed very friendly, chatted with a couple of the locals and the bar staff were welcoming too. Hard to believe there are many better pubs in the area.